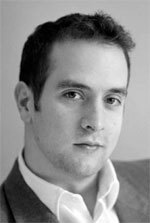 Born in London in 1978, British Composer Award winner Tarik O'Regan was educated at Oxford University and completed his postgraduate studies at Cambridge, where he was subsequently appointed Composer in Residence at Corpus Christi College. Described as ‘skilful and elegant’ (Sunday Times) and ‘beautifully-imagined’ (Financial Times), his compositions have been performed by the BBC Symphony Orchestra, London Sinfonietta and BBC Singers, as well as by many leading vocal ensembles. Living in New York City since 2004, O’Regan has held the Fulbright Chester Schirmer Fellowship in Music Composition at Columbia University and a Radcliffe Institute Fellowship at Harvard.